Before we move on to the first section of Stage Reason, let us give you some helpful information on operational procedures. Because we are not requiring a login for the first stage, we will not be using the Bulletin Board for questions and comments. Instead, any questions and or comments should be e-mailed to the Triple 7 Center. Let us most emphatically state that there are no stupid questions. We are here to assist you in any way we can, and if you don’t ask then we won’t know. We welcome positive and negative comments that are constructive in helping the Initiative, so please feel free to make suggestions about how we can make improvements. This is your journey as much as it is ours and the pace we move through each Stage will be largely determined by your questions and comments. We will start by posting a new section on a weekly basis, usually on a Saturday. When we feel that the majority of readers have grasped the Stage, we will move on to the next Stage. Don’t worry though if you are still not absolutely clear on any section of the Stage. Whenever we move on to the next section, the previous section will be available to download in PDF format from the web site, and you will still be able to ask questions through the Question Forum on any section of any Stage. We came across this wonderful quote from The Wisdom of Solomon in the book The Lost Language of Symbolism by Harold Bayley, “Reason is a spark struck by the beating of our heart”, page 120 volume 2. From this it would seem to say that Reason is from the heart, but we associate a “Reasonable person” with rationality of the senses and a balanced mind. Most people think of the heart as the source of emotion not rational thinking; so what is the quote saying. Obviously we need to examine the faculty of Reason. In doing this we discover there are 2 levels of Reason, Inductive and Deductive. In the first level, Inductive reasoning we take in information from the outside about an object or subject through the senses and “Reason” a conclusion about it. The second level, Deductive reasoning is taking that new information and dissecting it in our minds for a deeper understanding. The former is a superficial examination, but the deeper level of the latter often reveals a whole new meaning from what we originally thought. The 2 levels of Reason are portrayed in the Tetragrammaton (The Creator or Yahweh). The name Yahweh (Jehovah in English) is a simplified version of YOD HEH VAV HEH. The Hebrew letter HEH represents Reason and the 2 HEHs are relating the 2 levels of Reason. In just considering the above you begin to change the way you think. Your journey began earlier when we posed the question: “Would you associate your birth with the Color Blue or Pink?” If you use Inductive Reasoning you employ your sense of sight and immediately answer with what gender you were born; Blue for male and Pink for female. Alternatively, in using Deductive Reasoning you go within and examine how you feel as opposed to what you see. This is what the quote is saying; your higher Reason is from within your heart and not your senses. The Ancients left us many clues to discover the deeper meaning of Reason. It is through the use of both Inductive and Deductive Reasoning that the Human Race progresses. Scientific researchers begin with Inductive Reasoning by “observing” the results of experimentation. However, the “idea” for the experiment comes from the use of Deductive Reasoning. For example, the science of Quantum Physics, which has shown us that solid matter is an illusion, began with someone using the deeper level of Reason to wonder about the makeup of the atom. At this point, we must assert that this is not a new phenomenon. As we progress through the stages we will observe (Inductive) that many philosophers pondered the structure of matter; they just explained their conclusions in different terminology. With modern technological advances it is now generally accepted that at the subatomic level everything is vibrating energy. The recent discovery of the Mandelbrot Set, which through the computer takes us on a visual journey within the perfect way to use the first level of your Reason. If you haven’t already seen the video Fractals: The Colors of Infinity, we would strongly urge you to watch it because it is a visual journey of Spirituality. Even the scientists involved talk of being able to understand Creation in a new and Spiritual way. Although we learn through both Inductive and Deductive reasoning, it is only through the latter that we change the way we think. Deductive reasoning requires an open mind, which allows the deeper levels of understanding to surface from within. It is important to remember that you already know how to change the way you think; as we said, you have simply forgotten and just need reminding. We will return to the science of Fractals and the world within later, but first we want to apply Deductive Reasoning to the Mystical Arts. The Mystical Arts include Numerology, the Archetypal images in the 22 Major Arcana cards of the Tarot, Astrology, and Color. Generally the Mystical Arts were dismissed as superstition by the Academic community, but Ancient Wisdom used them in a very scientific way. So why have these valuable tools become so taboo. The simple answer is that in the past some people used the Mystical Arts for, shall we say less than altruistic methods. In later Stages of the Initiative we will be examining the affect of this in depth, but for now we are looking at the Arts from a useful tool perspective. Until recently, the only way to examine human consciousness was through the psychological sciences. Fortunately, today we have the technical ability to examine the brain and now know that our thoughts can be represented as electromagnetic pulses. Researchers tell us that there is an electromagnetic field emitted by the human brain. This is not surprising as we all know how it feels to be around an anxious or tense individual. The aphorism: “You could cut the atmosphere with a knife”, is also relating the phenomenon of the electromagnetic field. However, the uncomfortable “atmosphere” is created by feelings or emotions associated with the heart. It was not until researchers at the HeartMath Institute discovered that the heart emits a stronger electromagnetic field than the brain that the aphorism took on literal meaning (Could this be why The New Testament warns us to “be careful about what comes out of the heart”?). Nonetheless the Mystical Arts have for thousands of years been able to understand the electromagnetic field produced by a human being. That is because they interpreted the subtle energies surrounding a person through multiple mediums; such as Numerology, Astrology, Archetypal imagery, and Color. So taking this information and applying Deductive Reasoning we take the mystique out of the Mystical Arts by re-examining them with an open mind. Then we can see the Arts as a possible tool to interpret the deeper and more subtle energies that reflect the inner person. In the Hidden Codes of Life, there are 7 methods used, but to demonstrate the effectiveness of deductive reason we will key on the 4 mentioned above. The first on our list is Numerology. Anyone who has studied Greek Philosophy has heard of the father of Sacred Geometry, Pythagoras. We are not concerned with Sacred Geometry here, as that will be covered in the Seventh Stage. Here we want to examine the energy and consciousness of Numbers. Ancient Wisdom saw everything as affecting everything else, and Numbers could be seen as reflecting the more subtle energies and vibrations. The Kabbalists saw Numbers as representing their world around them. Numbers from one to nine were especially important and they believed these Numbers had specific meanings (Note: when we speak of Kabbalistic teaching, we are not referring specifically to the Judaic Religion. We see the Kabbalistic teachings as The Mysteries that many teachers referred to; including Plato and Jesus.). The Kabala of Numbers written by Sepharial summarizes the meaning the Kabbalists attributed to the Numerals from 1 to 9. The Kabbalists also assigned each number to a planet. 1 – They saw the Number 1 as: symbolizing “…manifestation, assertion, the positive and active principle ...it represents the ego...the unit of life, the individual…” Appropriately, the Number 1 represented the Sun. 2 – Not surprisingly Sepharial says the Kabbalists taught, “2 is the number of antithesis...active and passive...male and female...as uniting in itself opposite terms or principles, it denotes creation, production, fruition, combination...” The Number 2 represented the Moon. 3 – Number 3 represents “The trilogy, the trinity of life, substance and intelligence... the three postulates—the thinker, the thought, and the thing. Duality reflected in consciousness, as in time and space, making a trinity of states, as the past present and future...” The Number 3 represented Mars. 4 –The Kabbalists believed the Number 4 is the Number of “reality and concretion, the material universe…” The Number 4 represented Mercury. 5 –The Kabbalists thought 5 equated to “expansion,” plus “Justice, reaping, and harvesting…” The Number 5 represented Jupiter. 6 – Considering the sinister connotations associated with the Number 666, the Kabbalists meaning for the Number 6 is intriguing. According to Sepharial, 6 “is the number of co‑operation, marriage, connection...the interaction of the spiritual and material, the mental and the physical in man.” Evidently, 6 “also corresponds to goodness, beauty and truth…” The Number 6 represented Venus. 7 – For the Kabbalists, 7 represented “completion, time and space, the triad and quaternary; the perfect man, Adam Kadmon; the cycle of evolution; wisdom, perfection, balance, rest…” The Number 7 represented Saturn. 8 – The Kabbalists believed the Number, 8 related to “dissolution,” and “the law of cyclic evolution, the breaking back of the natural to the spiritual…” The Number 8 represented Uranus. 9 – In the Kabbalistic system, 9 correlated to “regeneration.” It also, “signifies a new birth, spirituality, sense—extension, premonition, going forth, voyaging…” The Number 9 represented Neptune. Before you dismiss Numerology out of hand as having no merit, consider how much thought we put into naming a child. From a consciousness perspective, without realizing it we are setting the vibration that will help consciously mold the child throughout his or her childhood. As the child grows and develops their own individual consciousness they will also alter their vibration, by shortening or even using a completely different name. Ancient Wisdom saw this as the natural assertion of their independence. Remember, we said that the world is vibrating energy. HOW SOUND CAN CHANGE THE WORLD relates that one of the most powerful ways to affect the world is through sound. Again we will cover this subject in depth later, but for now just stop and consider how you feel around different sounds. Then go a step further and think about how you feel about certain people’s names. Look at your name; do you like it? How do you feel when your name is called? Many adults do not like being called by their full name, because it reminds them of when as children their parents would chastise them. For instance, men called Jonathan may use the name John, because the name Jonathan makes them feel like a naughty boy. Using Deductive Reasoning, we are sure you will be able to find several instances in your life where the sound or vibration of a name elicited an emotional response from you. The next Mystical Art involves Archetypal images and Symbols. Dealing with Symbols first and using Deductive Reasoning we can see how much a part Symbols play in our everyday lives. Companies use Symbols in the form of logos to subliminally persuade us to buy their products. Think for instance of the large M Macdonald’s uses. Subliminally your brain associates this particular logo with food and you will often find that after seeing the logo you feel hungry. Another example of a common Symbol is in the Venus Symbol for women, and the Mars Symbol for men being used together to represent the male and female genders in procreation . Subconsciously whenever we see these Symbols, the brain associates them with gender. Turning to Archetypal images, perfect examples of Archetypes are the images in the 22 Major Arcana trumps or cards of the Tarot (Note: trump in this case is in respect to the 22 images as opposed to a suit rank in card games). An Archetype is something that represents a model or universal concept. For Instance an old man with a scythe or sickle, Archetypally represents Old Father Time. Or a pregnant matronly woman surrounded by an abundant natural setting represents Archetypally, Mother Nature. Another Archetype would be a Creator or King of the Divine Realm such as Jupiter, Zeus, Yahweh or Jehovah, which is Archetypally represented by a fatherly, magnificently robed man seated on a throne. We see all 3 of these Archetypes in the Major Arcana of the Tarot. Father Time is represented by Death; Mother Nature is represented by The Empress, and Jupiter, Zeus, Yahweh or Jehovah is represented by The Emperor. Subconsciously, the trumps convey deeper levels of meaning. Ancient Wisdom conveyed this by calling the 22 images the Major Arcana. The word Arcana translates as Mystery, consequently Major Arcana means Major Mystery. As you can see, there is only one trump, 13 – Death that isn’t connected to an Intelligence. As this brings in the discipline of Color, we will cover this anomaly later in the section. It will be helpful to see the Hidden Codes of Life in terms of how a psychologist finds a deeper understanding of his or her patient, by using word association or what the patient sees in ink blots. Through your name (s) and place, date and time of birth, your deeper Spiritual purpose is revealed. In the Codes, whichever trumps or cards are prevalent, particularly in the primary and Core Elements, reflects the underlying consciousness of the person. To demonstrate how the Mystical Arts are used in the Hidden Codes of Life, and because there has been so many questions we will be adding a supplement in our next posting. This is not part of the Initiative, but an example of the Hidden Codes. In the supplement we will be using the first 4 disciplines of a fictitious man’s codes and let us state that any resemblance to a real person is purely co-incidental. Our fictitious man’s name is John Everyman – middle name Paul – Born April 4th 1950 at 12:00pm in New York City. We realize that the chart above may be a little intimidating, but it is merely a snapshot of the Codes in order for us to interpret them, and it is not necessary for you to understand the chart completely. To help your understanding of how we interpret the Codes, each component will be addressed separately, so not to worry. Although the chart includes all 7 Disciplines, we will only cover the first 4 now. Each component is listed as Red for Primary, Blue for Secondary and Green for Secret or hidden. When we say secret or hidden, we mean those aspects of the Codes, which are not obtained by traditional Astrology or Numerology. With respect to the component, the Number is the Numerological element, which is determined by not only traditional Numerology, but also the Tarot Trump associated to the Number. The trump is also how we obtain the Astrological elements and the Color. One more thing before we proceed to the first component, we have only spoken of the Major Arcana, but as you are probably aware, there are 72 cards in a Tarot deck. The Major Arcana only consists of 22 trumps or cards, so what of the remaining 56? These 56 cards are what constitute the Minor Arcana, or Minor Mystery. The cards consist of 4 suits, wands, cups, swords, and pentacles. However, although these cards closely resemble a normal playing deck, they have one addition; as well as a king, queen and knight (jack) they add a page or princess to each suit. In the Hidden Codes, The Minor Arcana cards are linked to the Birthday, which determines the assignment of at least 4 cards. The Minor Arcana elements for John Everyman appear in Gold. As you can see the Hidden Codes are multileveled and it is important to remember that each component of the chart contributes to the overall consciousness underlying the person. The first component is determined by traditional Astrology. To understand how Astrology works, it will help to think of space as a sheet or plane of energy, with the spheres or planets of the solar system as balls creating depressions in that sheet. As the planets or balls move around each other, their respective positions affect the sheet or plane of energy. When a baby is born into this plane of energy, as he or she crowns at birth the soft spot at the top of the head is exposed. Because a new born baby’s skull is not fully formed, exposing the soft spot in effect exposes the brain to the energies of the planets on the sheet. This is the most powerful event in a human beings life, because this imprints the brain with the propensities for this incarnation. Numerology, set the external vibrations by choosing the child’s name, Astrology imprints the inner consciousness by the positions of the planets in respect to each other. These very specific energies affect everything in the baby’s life, from personality to what career he or she will choose. Think of this as a baseline for everyday operation which is recorded in the Natal Chart. It may also help to visualize an imaginary circle with a newborn baby at the center of the circle. Around the baby in this imaginary circle, positioned are all the planets and constellations. This is what astrologers call a Natal Chart. They divide the chart or imaginary circle into 12 segments, which they refer to as houses. To each of these houses is assigned a sun-sign or zodiacal sign. The position of the Sun determines what sun sign the baby is born under. Each of the 12 houses rules or influences various elements of your life, such as finances and health. For example, astrologers would see the Sun positioned in the second house, the house of finances as the child having a propensity for generosity. Let’s take a look at Mr. Everyman’s chart wheel. To determine which sun-sign he falls under, we look for the Sun Symbol on the wheel – and look for the glyph which determines the sign – as you can see Mr. Everyman’s sun is designated as , which is the Symbol for the sun-sign Aries. From the list above we observe that Aries falls under the Number 4 which is assigned to The Emperor, the Color Red, the planet Mars and the faculty of Reason. As stated, The Emperor is also the Archetype of Jupiter, Zeus, Yahweh or Jehovah. Because there are only 12 sun-signs, many people have the same sun-sign. Therefore, to personalize it more, astrologers look to the Ascendant, the second primary component of your Codes. The Ascendant is calculated from the exact time you were born and is known also as your rising sign. The rising sign is the sign or constellation which is rising on the eastern horizon at the time of birth. The Ascendant on the chart as you look at it, is to the far left. In Mr. Everyman’s case his rising sign is Cancer – , in which the Archetypal image is The Chariot. Cancer also represents the Number 7, the Moon and the Color Orange-Yellow. This is particularly interesting, because Aries is a fire sign; whereas Cancer is a water sign. This in no way is saying that everything that happens is preordained. On the contrary, Astrology teaches that the happenstances and character traits a person is imprinted with at birth can be overcome or enhanced as the case may be. And so, although the Codes are not designed to forecast the future, the natal chart does show what propensities a person was born with. Chinese Medicine, the basis of Taoism also assigns elements to the time you were born. They also assign an organ of the body. Like the Ancient Wisdom through Tarot, Taoism also uses familiar terms to represent Archetypes. Mr. Everyman was born under the element Fire and the organ Heart. This strengthens the fire element and indicates that among other things he has a warm heart. Before we move on to the 3rd component something needs to be said about the term Core Energy. In traditional Numerology, the person’s main Numbers were obtained through 4 elements, to which Numerologists assigned different percentages. The most important was the Life-Path, then the Expression, followed by the Soul Urge and finally the Birthday. The 3rd component, the Life-Path is calculated by the birth date and as stated, is the first and most important element of the Core Numbers, constituting 40% of the Core Energy. Our fictitious Birth-date is April 4th 1950 which is reduced to – 4 (April fourth month) 4 (Fourth day) 6 (Year reduced to a single Number i.e., (1+9+5+0 = 15 – 1+5=6). Consequently John’s Life-Path would be written out 4+4+ (1+9+5+0 = 15 – 1+5= 6) = 14 – 1+4=5 This means he has a Life-Path of 5. Checking the list above, we see that the Number 5 is assigned to The Hierophant, the planet Venus, the Color Red-Orange and the faculty of Intuition. Traditional Numerology says that this Life-Path indicates a person with many talents. However, it warns to be careful to find a focus, because the individual may have a tendency of being a little scattered. The 4th component also comes from the Life-Path, but this component can come through any of the Core Elements. A Karmic Debt occurs when a Core Number is reached through the karmic Numbers 13, 14, 15, 16 and 19. In traditional Numerology, 15 isn’t a karmic Number, but it is in the Hidden Codes. John as we said has a Karmic Debt of 14, which brings in the second row of the Tarot Tableau. 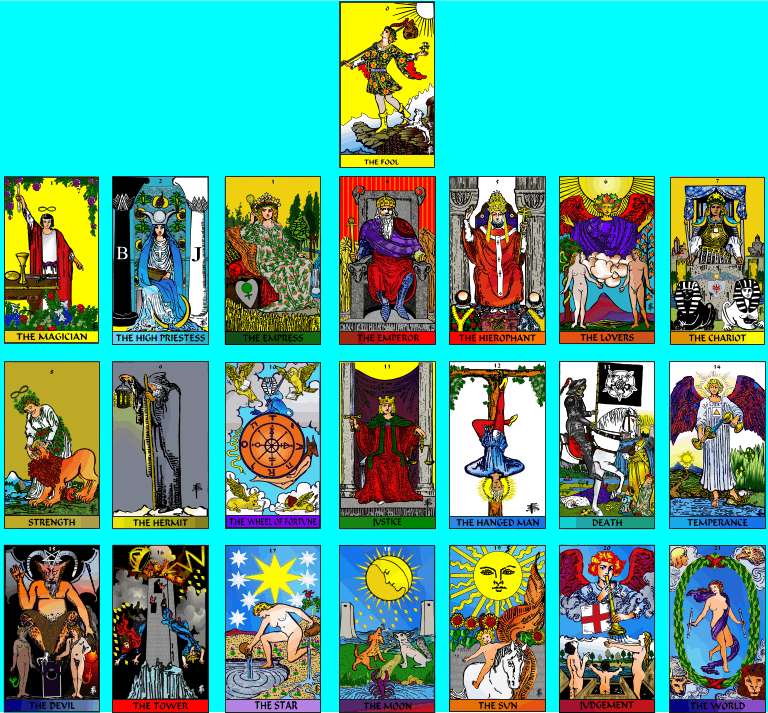 According to Daphna Moore, the second row of the Tarot Tableau represents THE CHIEF LAWS OF CONSCIOUSNESS AND OF THE UNIVERSE. In traditional Numerology, a Karmic Debt in the Core Elements used to mean that you were dealing with issues from a past life. As the Codes are predicated on this being the Fullness of Time, a Karmic Debt in the Codes indicates a strong Spiritual or humanitarian purpose. Card 14 – Temperance represents the planet Jupiter, through Sagittarius, and the Color Blue. When this card appears in someone’s Codes we see it as an important indication of their Spiritual purpose. This is because Temperance on the highest level or Archetypal level, represents Timelessness or Eternity. The Birthday is also a Core Element but only represents 10% of the Core energy. John’s Birthday Number is 4 and is Archetypally represented by The Emperor. His birthday also represent the Number 4, Mars, the Color Red, and the faculty Reason. Energy wise, as John’s Birthday Number is the same as his traditional sun-sign, we pay more attention to it because it holds more value. Furthermore, because the Birthday Number falls between 1 and 10 one of the Sephirot on the Tree of Life is connected to his Codes. But first let’s examine the Minor Arcana aspects of John’s Codes. As we said, it is the Birthday that generates the Minor Arcana elements. In traditional Astrology each sun-sign is divided into 3 decans. That is also the case in Kabbalism. Each sun-sign is divided into 3 decans and assigned an individual minor card. To understand this we will reference Robert Wang’s book The QABALISTIC TAROT A TEXTBOOK OF MYSTICAL PHILOSOPHY, which has a diagram consisting of 6 concentric circles. At the very center is a circle of the Symbols for the 12 signs of the zodiac. In the next circle, the 12 signs are divided by 3 and assigned the appropriate Minor Arcana card to each of the 3rds. The appropriate card is determined by the next circle, which records the range of dates of each card. Circle 4 contains the 12 kings, queens and knights/princes of each suit; whereas, circle 5 consists of the 4 princesses/pages of each suit. Finally the outermost circle is divided into the 4 suits’ aces. In this method we can determine not only which card from 2 to 10 represents your date of birth, but also which ace, page/princess and court card you fall under. 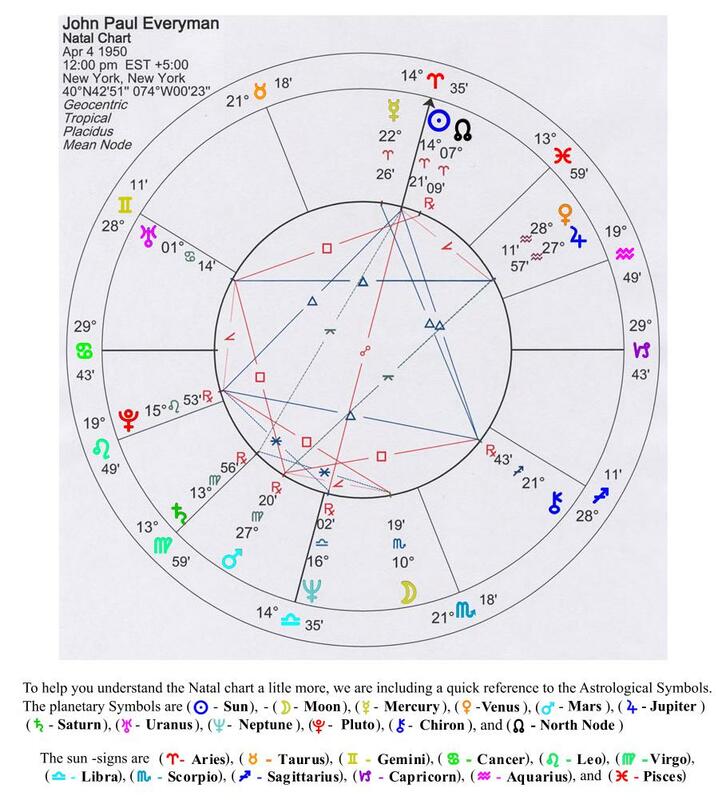 Still because John’s birthday is between 1 and 10, as stated, he has the Archetypal energy of a Sephirot connected to his chart. The Sephirot connected to his chart is Chesed, which although assigned to the element Fire, instead of the planet Mars, represents the planet Jupiter. Remember, The Emperor is the Archetype of Jupiter, Zeus, Yahweh or Jehovah. As Chesed represents Mercy, the Fire element is tempered and instead of an out of control destructive wildfire, is the fire of active creation, bringing impetus and growth. As was stated, if the Birthday Number is reached through any of the karmic Numbers 13,14,15,16 or 19 then a Karmic Debt comes into play. But as John’s Birthday doesn’t involve any of these Numbers it doesn’t apply, so we will move on to the 7th component. Archetypally this represents the Transformed Heart through card 8 – Strength. It also represents the Color Greenish-Yellow, and the Sun. If the Traditional Chart’s Number is reached through any Number between 10 and 21, then the 8th component would come into play. However, as John’s Traditional trump Number wasn’t, then we can move on to the next component. As the next 5 components are all generated by the Secret Life-path and the Secret Chart, we will include all 5 together. But first let’s briefly explain how we arrive at the components elements. The 9th component is a secondary element in the Codes. The Secret Life-Path is created through shifting the month of birth back 2 months, i.e., instead of April 4th, the date would be February 4th. So the Secret Life-path would be 2+4+(1950 = 15 – 1+5=6) = 12 – 1+2=3. Apart from the number 3, this component generates The Empress, the Color Green, and the planet Venus. It is also the Archetypal image of the Individual Subconscious and Creative Imagination. The Empress, as we said is also the Archetype for Mother Nature. Like the Traditional Chart, the Secret Chart is also calculated by assigning the elements to the relevant Tarot trumps or cards and adding the values together. However, the Secret Chart has only 11 elements. So John’s Secret chart reads. Archetypally this represents the Self-conscious, Intellect, and Will through card 1 – The Magician. It also represents the Color Yellow and the planet Mercury. Because the Secret Chart’s Number 1 is reached through the Number 10, the 11th component comes into play. Applying the same procedure as the Secret Sun-sign to the Secret Ascendant, we get The Hierophant, the Number 5, the Color Red-Orange, the planet Venus, and the Archetypal consciousness image of the 1st stage of the Higher Self and the faculty of Intuition. Having covered the 5 elements of your Secret Life-Path and Secret Chart, let’s take a brief look how these components of the Codes developed. There is a very valuable lesson to be learned about the hidden energies in the Secret Life-Path and the Secret Chart’s elements. First it helps to understand that Aries hasn’t always been the first sign of the Zodiac, it was Aquarius. As the sign that heads up the zodiac used to be Aquarius, the question that begs to be asked is why does modern astrology place Aries in that position? The answer is the astrologers of the Roman era adjusted the zodiac to fit in with their observations. The Roman Empire rose during the Age of Aries, which extended from 2,276 B.C.E. to 136 B.C.E. Before the Romans introduced July and August in honor of Julius Caesar and Augustus Caesar to the calendar, the year consisted of 10 months. That is why the last month of the year is named December, meaning the 10th month. In addition, we owe the names of the planets of the solar system to the Romans, because they renamed the Greek pantheon and assigned a planet to each main god. For instance Zeus became Jupiter and Hermes became Mercury. The Romans placed Aries at the head of the zodiac because in ancient times the year began on the Spring Equinox and as we said, the sign of Aries rose at sunrise during the rise of the Roman Empire. That is why they venerated the god of war, Ares, which they called Mars. Conversely, the Chinese New Year begins in the sign of Aquarius and astrological Chinese writings date to at least 4 thousand years ago. The above is the exoteric or open explanation for the secret elements of Astrology; however, it is through the Secret Life-path and Secret Chart that the real benefit of the Codes is revealed. To explain, the Secret Life-path and Chart posits you being born during the 7th month of pregnancy, because it is then that you first become a potential spiritual individual. In other words, placing Aquarius at the start of the zodiac makes the 7th month of pregnancy’s energies the predominant factor. We will return to this in later stages. The 14th component brings in the second most important aspect of the Core Elements, because it constitutes 30 % of the Core Energy. John’s Expression is 6 and comes from all the letters in his first and last name: J=1 + O=6 + H=8 + N=5 + E=5 + V=4 + E=5 + R=9 + Y=7 + M=4 + A=1 + N=5. This adds up to 60, which when reduced: 6+0=6. Checking the list we see the Number 6 is Archetypally represented by The Lovers, which symbolize the 2nd Stage of the Higher Self and the faculty of Discrimination. This Expression also brings in the Color Orange and the planet Mercury, through the sun-sign Gemini. If the Expression number is reached through any of the karmic Numbers 13,14,15,16 or 19 then a Karmic Debt comes into play. But as John’s Expression doesn’t involve any of these Numbers it doesn’t apply, so we will move on to the 16th component. The Soul Urge is a very important aspect in determining the energies surrounding the name. This is because it represents 20% of the Core Energy. The Soul Urge is derived from the vowels in all the names, including any middle names. These are then reduced to a single digit. John Paul Everyman’s vowels are O=6+ A=1+ U=3+ E=5 + E=5 + A=1 – This adds up to 21, which reduces to 3 - 2 + 1 = 3. This is represented by the same Archetypal image as his Secret Life-path, The Empress. Again, it is important to remember that The Empress is the Archetype of Mother Nature. Although John’s Soul Urge is not reached through any of the karmic Numbers 13,14,15,16 or 19 there is another trump or card connected to this component. Because the 3 is reached through 21, card 21’s energies become relevant. Again, checking the list we observe that card 21 is The World, which Archetypally represents the Union of Opposites. It also brings in the Saturn vibration and the Color Indigo. As stated, ordinarily in traditional Numerology only 4 elements are considered important factors. Nonetheless, because of the Archetypal meaning of the Hebrew letters, which are assigned to the 22 cards or trumps of the Tarot’s Major Arcana, the consonants of the name are of vital importance in the codes. This is because the consonants of the name give you the Secret Self. John Paul Everyman’s Secret Self is determined using the same process as above, only as we said just the consonants; i.e. J=1 H=8 N=5 P=7+ L=3+ V=4+ R=9 +Y=7+ M=4 +N=5 = 53. Again this Number needs to be further reduced to a single digit 5+3=8. This equates to trump or card Number 8, Strength, the same as the Traditional Chart. Because John’s Secret Self doesn’t involve any of the karmic Numbers we will move on to the 20th component. The final primary component is calculated through all 5 Core elements added together. To recap John’s Core elements are Life-Path 5; Birthday 4; Expression 6; Soul Urge 3, and Secret Self 8. This results in 5+4+6+3+8 = 26 – 2+6=8. As you have observed this is represented by the same as his Traditional Chart and Secret Self, which is Strength, and the Transformed Heart. The name generates 3 more elements to the Codes. The first is the Growth number. The Growth number is created through the letter value of the first name. In John’s case this is J=1 + O=6 + H=8 + N=5 = 20 2+0=2. This brings in the Archetype Universal Sub-consciousness or Cosmic Mind, which is represented by The High Priestess. As you can see in the list, The High Priestess also represents the Memory and Emotions, which is symbolized by the Moon and the Color Light Blue. Another aspect is brought into John’s Codes, because his Growth Number of 2 is reached through the Number 20. Due to card 20 being Judgment, this has special relevance. The reason is Judgment is the Archetype for the element of Fire and John’s Chinese Medicine element is Fire. The Kabbalists only used 3 elements, Air, Water and Fire. They felt that Earth was a combination of the 3 and therefore not a separate element in its own right. Judgment also represents the planet Pluto and the Color Red. On a deeper level the first name, first letter, and first vowel reveal more than traditional Numerology purports. In traditional Numerology, the Growth Number only uses the Numbers 1 to 9, plus the master Numbers 11 and 22, which only involves the first nine cards and Justice, The Fool, and The World in the Major Arcana. Instead if we include all 22 trumps or cards we reveal a very surprising result. John as we said in traditional Numerology produces a Growth number of 2, which equates to The High Priestess. But if we use all the cards then John’s Growth Number for the Codes is 11: J=10 +O=15 +H=8 +N=14 – This adds up to 47, which is further reduced 4+7=11 This is Archetypally represented by card 11 – Justice; Balance or Equilibrium, Venus, and the Color Green. John’s middle name is Paul, which has the value 14. Numerologically this reduces thus: P=7+ A=1+ U=3+ L=3 to 5. This is represented Archetypally by the 1st Stage of the Higher Self, which is the same as John’s Life-Path. To recap: Checking the list above, we see that the number 5 is assigned to The Hierophant, the planet Venus, the Color Red-Orange, and the faculty of Intuition. As John is over 40, the Maturity Number applies. The Maturity Number is derived by adding together the Numbers of the Life-Path and Expression. Consequently, John’s Maturity Number is 5+6 = 11. This is Archetypally represented by the same image as his Codes Growth number, Justice. John’s first letter is J, which in traditional Numerology has the value of 1. As in the Secret Chart, this is Archetypally represented by The Magician, which represents the Self-conscious, Intellect, Will, the planet Mercury, and the Color Yellow. Applying the same process to the first letter as the Growth Number shows as you can see that J=10. This brings in the energy of Jupiter through card Number 10, The Wheel of Fortune. The Wheel of Fortune also represents the Color Violet, and the cycle of evolution and involution. The 26th and 27th components are both determined by the first vowel of the first name. But like the Growth Number and the first letter there are 2 ways they are calculated. In traditional Numerology, John’s first vowel O is valued at 6, which is archetypally represented by The Lovers, the same as his Expression. In the Codes, John’s first vowel O is valued at 15, which brings in the Archetypal image of The Devil. The Devil evokes strong feelings, usually negative. Nonetheless, from an archetypal perspective, the Devil has a valuable lesson to teach. Firstly we should state that the trump or card 15 – The Devil represents what St. Paul called the natural body. The tails on the figures of the man and woman, signifying their animal natures, demonstrates this. This means that it is through the physical body that the Spiritual is obtained. The occult message of The Devil, according to Daphna Moore is that it is through the use of the body for physical sensation that an individual learns Spirituality. She writes, “The number of THE DEVIL card is 15, which indicates THE HIEROPHANT or 5, working through THE MAGICIAN, or 1. This tells the story so often told, that THE HIEROPHANT teaches man through the urges of the body for sensation until man has learned, by subduing his instincts, to listen to THE HIEROPHANT on a higher level than mere sensation. That higher level, at its perfection, is shown in card 6, THE LOVERS, and 1 plus 5=6.” The Devil also represents the planet Saturn, and the Color Indigo. The 30th component is calculated by which element is most prevalent in the Secret Chart. The 12 sun-signs are divided between the 4 elements. In John’s case the most prevalent element in the sun-signs is Air. The element Archetypally represents The Fool, Beginnings, Uranus, and the Color Light Yellow. The final component is also calculated through the Secret Chart. Each element of the Chart is given a value, which is added to the value of the sun-signs Tarot trump or card. For instance, the Ascendant is valued at 1, which in John’s case is added to the Number of the card that represents Taurus, which is 5. This is continued through all 11 elements until a final Number is reached. John’s Secret Trump is, as his chart shows, The Lovers. However, next to the component on the Chart is the Symbol for Saturn which means that John’s Secret trump is reached through another card. For John, this is the same as his Code Vowel, The Devil. As you can see the Planet Venus is the most prevalent of the Planets, but that would not necessarily mean it is John’s Key Planet. To determine which are the Key Elements necessitates the use of both Inductive and Deductive reasoning. First we look (Inductive) at the main chart’s primary features to determine which Number appears the strongest. In John’s case it is the Number 8, which is Archetypally represented by trump/card 8 – Strength. But checking the list we see that Strength represents the Sun, so shouldn’t the Sun be the Key Planet. As the above chart shows, the Sun appears 3 times in the Codes; whereas Venus appears 10 times; 5 solo and 5 secondary, but it is the Primary (Red) elements in the main chart which are the deciding factor. Going deeper (Deductive) we are moved to examine the Core elements again and we discover that Venus represents 60% of the Core Energy as well as appearing with Mercury in 30% through the Expression. When we examine the 22 Major Arcana cards in later stages, we will discover that The Emperor is the consort of The Empress and these 2 cards are inextricably linked together. Consequently, because John’s Birthday is The Emperor, 100% of the Core Energy is connected to the Planet Venus. The final aspect that would clinch the Planet Venus being the Key Planet is our 4th discipline, Color. In the chart above, John’s Colors are 8 yellow and 8 green, which means they are equal. To separate the Key Color, we need to see which Color appears individually the most. Yellow appears individually twice; whereas Green appears 4 times. So as The Empress or Venus is assigned the Color Green, Venus is the Key Planet and Green the Key Color. Once we have obtained the Codes for John through observation (Inductive), we then apply Deductive Reasoning to interpret them. The first thing that strikes us is the balance between the masculine/active and the feminine/passive energies. However, the most relevant information to John’s spiritual evolution is found in the prevalence of Archetypes; particularly The Emperor – Creator, and The Empress – Mother Nature. In spite of the repeated reference to the former, we would interpret the strongest influence on John as his Creative Imagination. His Key Number 8 also reveals a deeper purpose. In the list Daphna Moore assigns trump/card 8 – Strength to Intelligence of the Secret of all Spiritual Activities. Moreover, Strength represents the Transformed Heart. Still, it is through all 4 Disciplines of the Mystical Arts of Numerology, Astrology, Archetypal Images, and Color that we see John’s potential. Although we covered the basics of the Mystical Art of Astrology in the supplement, we haven’t discussed Astrology as it is associated with the Mystical Art of the Tarot’s Major Arcana. The 22 trumps or cards are divided into 3 Mother, 7 Double and 12 Simple Hebrew Letters. Appropriately, the 12 Simple letters represent the 12 signs of the Zodiac. As the earlier list showed, these are Aries – The Emperor, Taurus – The Hierophant, Gemini – The Lovers, Cancer – The Chariot, Leo – Strength, Virgo – The Hermit, Libra – Justice, Scorpio – Death, Sagittarius – Temperance, Capricorn – The Devil, Aquarius – The Star, and Pisces – The Moon. There are 7 Double Hebrew Letters that represent the Seven Sacred Planets, which will be discussed from an Archetypal perspective later. Because these 7 trumps or cards represent the Seven Sacred planets they are also associated with the 7 main chakras. 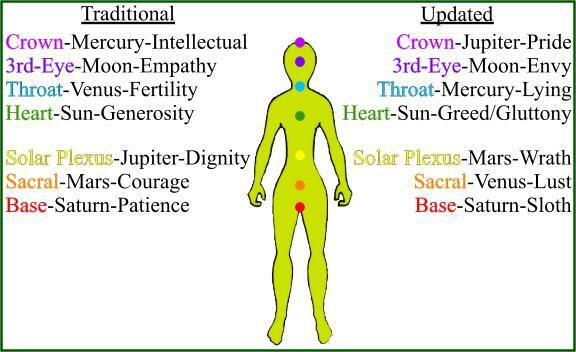 Without going to deeply into the chakra system, as we said, the traditional chakra system has changed from the traditional, which was base – Saturn, sacral – Mars, solar plexus – Jupiter, Heart – Sun, throat – Venus, 3rd-eye – Moon, and crown – Mercury, through the updated which became base – Saturn, sacral – Venus, solar plexus – Mars, Heart – Sun, throat – Mercury, 3rd-eye – Moon, and crown – Jupiter. The Seven Sacred Planets, which are represented by the 7 Hebrew Double letters are Mercury, represented by The Magician; the Moon represented by The High Priestess; Venus, represented by The Empress; Jupiter, represented by The Wheel of Fortune; Mars, represented by The Tower; Saturn, represented by The World. So the chakra system of a human being is also connected to the 7 Hebrew Double letter trumps or cards that represent the Seven Sacred Planets, and the Mystical Arts reveals the connection between seemingly unconnected elements. In the spiral diagram below, all 22 images of the Major Arcana are involved, which means the chakras or energy centers can also be tied to the archetypes of the Major Arcana. As the spiral diagram below portrays instead of moving from the base up to the crown, we are now spiraling from above the crown inwards through the base – Mars and Pluto, crown – Jupiter and Mars, sacral – Venus and the Sun, 3rd-eye – Saturn and Moon, solar plexus – Mercury and Uranus, throat – Moon and Neptune, finally into the heart – Sun, Chiron, and Venus. As you can observe, each chakra has more than 1 astrological element assigned to it. This is because the higher octaves of Mercury, Venus and Mars have been brought in. The 3 higher octaves are represented in the Major Arcana as the 3 Mother Letters. These letters represent primarily the 3 Kabbalistic elements of Air – Hebrew letter Aleph and The Fool; Water – Hebrew letter Mem and The Hanged Man; Fire – Hebrew letter Shin and Judgment. Through Deductive reasoning we can begin to see patterns. If we associate Air to the Mental plane, Water to the Emotional plane, and Fire to the Archetypal plane, then we can see how the trumps/cards reveal the energies and vibrations within a person. However it is Color, the last Mystical Art of the 4, which ties everything together. Through a prism we know today that White or daylight is the combination of 7 Colors. The only Color that stands apart is Pink, which interestingly is the combination of Red and White; the 2 Colors traditionally associated with the base and crown chakras. The other 6 Colors are either the 3 primary Colors or combinations of them. The Fool is the first card in the Major Arcana and it introduces us to the use of Color as representing conscious energy. The ancient sages taught that the Life principle was a solar force, hence the bright Yellow sky in The Fool. The 22 trumps deal with various combinations of the 3 primary colors Red, Yellow and Blue. Black, which signified either occult knowledge or ignorance/materialism and White, which symbolized the purified or Spiritual can be added to the primary Colors to create various shades. Daphna Moore in The Rabbi’s Tarot explains Color as relaying a deeper meaning. Looking at The Fool card/trump in the Rider-Waite deck from a spiritual perspective, certain aspects jump out. The card/trump depicts a young man gazing upward wearing a flamboyant tunic, which is gathered at the waist with a belt of the 12 signs of the zodiac. He wears a Red feather in his Green cap and holds a White rose in his left hand. Over his right shoulder is a staff with an Orange cloth bag attached. The sky or background of the card is bright Yellow in which a large White sun bathes the youth with its rays. Beneath his flamboyant tunic is a White undergarment. On his feet are pale Yellow boots and at his feet a small White dog yaps at his heels. White has always been associated with purity and the Tarot trumps are no exception. As we said, whenever the Color White appears in a card, it symbolizes the Spiritual or purified. For instance the White sun in the card The Fool, represents the Archetypal plane above all existence. The White undergarment the youth wears expresses that before clothing itself in a body and entering the realm controlled by the stars (represented by The Fool’s zodiac belt), the Life breath/force/principle or Spiritual Soul was pure and untainted. As for the little White dog yapping at the youth’s heels, according to the sages, this symbol stands for the purified mind or intellect, meaning that a person needs to have his or her mind subject to the Higher Self within them. Despite the Color White representing the Archetypal plane, the Life Force is solar, which of course is golden or Yellow. Half of the 22 Major Arcana cards are assigned a Color combination that includes Yellow. As reported, in the card The Fool, although the entire sky or background is bright Yellow, a White sun shines in the sky. At some level the human race has always associated the color Yellow with the Divine or Spiritual plane. All ancient civilizations revered the Yellow metal, gold. Many believe that the builders of the Great Pyramid at Giza, Egypt were aware of the properties of electricity because they believe that the missing capstone was composed of pure, solid Yellow gold, an excellent conductor of electricity. It is interesting that it is only in recent times that White gold has become popular. Ancient civilizations believed the Sun or Yellow gold symbolized the masculine principle, whereas the Moon or White silver represented the feminine principle. Alchemists in the Middle Ages seemed obsessed with discovering the Philosophers’ Stone, the supposedly secret formula for turning lead into gold. However, the alchemists hid their true purpose. The alchemists weren’t concerned with turning lead into gold but rather transforming themselves into supermen. They knew that Humanity’s destiny was to evolve into supermen and women. The key was in the Color of lead and its secret meaning. The Color of Lead; Black in this case symbolizes matter or the body/individual at its densest or most ignorant and selfish, whereas the Color of gold; Yellow symbolized the Spiritual use of the Solar Life Force. The alchemists used the Philosophers’ Stone as a metaphor to symbolize an individual gaining purity and enlightenment through the transmutation of lead into gold. The alchemists were both astrologers and Kabbalists; in as much as they studied Astrology and the Kabbala. Nonetheless, they knew that it was the Tarot that held the secret to making the transformation. Moreover, the alchemists knew it was the Kabbala that held the key to unlocking Tarot’s mystery. Was this what Jesus meant when he said to the Pharisees (the scholars of Jewish mysticism) “You have the keys”? To return to The Fool, we mentioned that instead of a Blue sky, the youth is surrounded by a bright Yellow sky. As we stated, bright or light Yellow symbolizes the solar force or Life Breath/Force. This force permeates all living organisms, which is why human beings worshipped the Sun and adopted gold as the Color for the Sun Symbol. Although the sky isn’t Blue in The Fool, the Color Blue is still in the card. Below the shelf, which the youth stands on is a Blue area, which denotes the Cosmic Consciousness of the material plane. The shelf also stands for the Veil between the material or Earth plane and the Archetypal Plane. Ancient Wisdom, as we said saw Color as representing different energies. If we think about it so do we. Using Deductive Reasoning what is the first thing that comes into your head when you visualize the Color Red; blood, anger, war, or fire? Now visualize the Color Blue. Did you think of water, sky, the sea, or peace? We all associate Colors with feelings and or actions. For instance, people generally wear Black at funerals, because it denotes mourning and grief. There are literally hundreds of examples of Color invoking emotions. Nevertheless, the most effective use of Color the ancients incorporated was in the Colored images in the Major Arcana which carried information about Archetypes and consciousness. So using Deductive Reasoning lets consider the Colors of the Temple of Reason in respect to Color assigned to the cards. The list of the Major Arcana shows, the color Red is associated with Reason, Intuition, Illumination, Corporeal Intelligence, and Order within Change. But the temple is also Turquoise. The Color turquoise is the combination of Blue and Green. If we look at the list above, we see that card 13 – Death, which Archetypally represents Transformation, is assigned Blue-Green. It also represents the sun-sign Scorpio, which is ruled by the planet Pluto. However, as we mentioned Death is the only card not associated to a type of intelligence. It is also the only card that is associated with both Blue and Green. Daphna Moore says Death represents the occult (hidden) extension of MOTION and CHANGE. 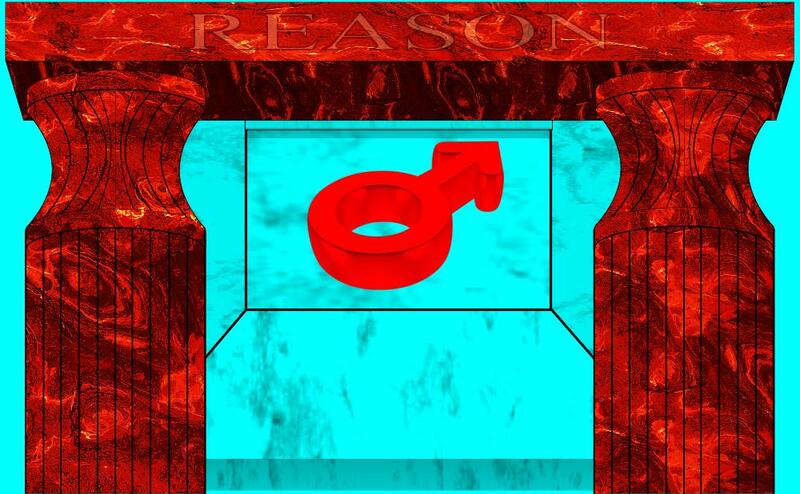 Consequently, through the Mystical Art of Color we can see that the Colors Red and Turquoise for the Temple of Reason is saying that if you use Reason correctly you transform Reason into its higher level, Intuition. This brings illumination to how you can change the physical world. Deductive Reasoning can also be applied to the most important message given through The Christ to Humanity: The Kingdom of God is Within You. This simple statement is the key to understanding how to change the world. We touched on this earlier, but in Section 2, we will be examining the statement from the modern perspective, using the recent discovery of Fractals. In Section 3 we will be taking a new look at the characters in the New Testament from the hypothesis proposed in and The Good News. If you haven’t already downloaded a copy from the web site, we suggest you do, as we will be referring to it in the next section. If you prefer to use a book, you can purchase a copy from the link on the web site. To reiterate, all proceeds from the book goes to the I.D.E.A. Foundation for the Benefit of Humanity. As you have probably gathered by now, we are moving very slowly through the Initiative. This is because we are gauging how you are all receiving the material. Consequently, instead of moving on to the discussion on the application of Deductive Reasoning and the Kingdom of God is Within, we will pause for a moment to answer the question of how and when the various levels of consciousness emerge within a human being, particularly when we begin to use Inductive Reasoning. This Initiative is called the Know Thyself Initiative, because is an exploration of Your consciousness. The goal of the 7 Stages is to change the way you think and transform the world. However, in order to change the way you think, you first have to know how you think; hence the term Know Thyself. It is only recently, through the brilliant work of Eckhart Tolle that the concept of individual thinking has been brought into question. We will be examining Mr. Tolle’s understanding of how an individual’s thoughts are not always their own in the Stage - Intuition. But in this Stage we wish to employ Reason to address the question “How do I think?” The answer will necessitate an investigation of the development of human consciousness. In other words, we need to go back to the beginning; your birth. In Section 1 we discussed how the Mystical Arts of Astrology and Numerology could be used to understand the various influences on an infant human being. To recap: Astrology determines the electromagnetic configuration of energy waves. These energy waves imprint the baby’s brain through the unprotected soft spot at the top of the head, and set the pattern for the present incarnation. As stated, which pattern is established through the positioning of the planets at the moment of birth, which is recorded as a Natal Chart. We will not get into a debate over predestination here. Suffice to say, the configuration of electromagnetic energy wave imprint is designed to set up the best possible circumstances for the soul of the individual to achieve it’s purpose in the incarnation. The next strongest influence on a human being is found through the Mystical Art of Numerology. Again, to recap: this is determined by the name a child is given. Both the Mystical Arts of Astrology and Numerology are further defined by the Mystical Arts of Color and Archetypal Images. Nonetheless, from birth to 5 years of age there is another very powerful influence on the child, which involves past lives. If you cannot believe in even the possibility of reincarnation, then you will not benefit from this understanding. For those of you who are open, let us continue. There is ample documentation of very young children having past life memories. Craig remembers clearly speaking to adults as a baby and being amazed that they could not understand his baby gibberish. Of course the adults dismissed his attempt, but it is curious that he remembers one of the adults saying, “Look at him, he’s trying to talk.” Afterwards, the baby Craig “consciously” understood that he would need to learn how to talk again. Like most children Craig forgot this episode and got on with the business of being a child again in this incarnation. Still, the memory of when he tried to talk as a baby would resurface again when he was called. He sees this as a gift that helped him believe what he was being told. Returning to children under 5, these children often have a unique perspective on life because during this period the child is using Deductive Reasoning. That is why Craig could “Reason” he would need to learn to speak again. If parents or guardians pay attention to what their children say, engaging them in conversation, they may be surprised at what they hear. At this time the child’s Spirit is at its strongest and the false self or ego at it’s weakest. Moreover, the soul of the child vaguely remembers its imperative for the incarnation, which as it grows becomes more and more fleeting. By the age of 7, unless the memories have been fostered by an adult, most children will have no concept of any pre-existence. It is important to remember that there are 18 levels of consciousnesses on the planet today and that only 12 levels are ready to Spiritually Evolve. This means that a 1/3 of the Human Race are relatively new souls, with a large percentage of the 1/3 incarnating for the first time as a human being. Consequently, not all children will have memories of past lives. Leaving the discussion until later on how these individuals will be helped, let us return to the 12 levels of consciousness that are ready to Spiritually Evolve. After 7 years of age the individual child normally switches to using Inductive Reasoning by taking in information through the 5 senses. At this time the ego begins to exert control over the mind of the child. This is where an adult’s influence is critical as to whether the true or false self, emerges victorious. Today we are witnessing the result of that influence. We are not concerned with a discussion on parenting here, but the most efficacious way to help a child fulfill his or her Spiritual purpose. We must say that there is no absolute right or wrong way to raise a child. This is because each child is unique and has different needs. Some children will need a firm, but kind hand to keep them out of trouble; whereas other children will respond to reason and reward. Nonetheless, there are 2 absolute requirements that all children need to Spiritually evolve and that is Absolute Honesty and Consistency. As the child develops they are constantly using Inductive Reasoning through observation. They not only learn how to act and behave through observation, but also how to judge and form opinions. After 7 years of age children are learning which urge to follow; the metaphorical angel or devil. The angel or Spirit represents restraint, self-discipline, and responsibility; whereas the devil or ego represents self-indulgence, gratification, and impulsiveness. In view of this we can understand the struggle for control going on within a child. The easiest way to give an advantage to the devil/ego over the angel/Spirit is to create uncertainty. There is an old saying, “Spare the rod and spoil the child”. Generally this is thought to advocate the use of corporal punishment, as a rod is a term for a bunch of sticks used in beating. However, as you will discover old sayings and proverbs often have multiple meanings. In fact, there are several definitions for the word rod. Deductive Reasoning from within tells us that because there is more than 1 definition for rod, the saying “Spare the rod and spoil the child” must have more than one meaning. The Ancient sages often hid Secret Wisdom in seemingly regular everyday sayings, which means there is a good chance that 1 of the meanings for the saying is Spiritual; it is. The deeper or Spiritual meaning can be discovered in the definition of rod as a unit of the measurement through the Mystical Art of Symbolism. The length of a rod is the same as an ox-goad, which was used to drive oxen in plowing fields. A Symbol was given to each of the 22 Hebrew letters and the ox-goad was given to Lamed. The Mystical Art of the Archetypal images of the Tarot assigns Lamed to the trump or card 11 – Justice, which represents balance. In plowing, the ox-goad is used on an ox, which is the Symbol for the Hebrew letter Aleph, assigned to the trump card 0 – The Fool, which represents the preincarnate Spiritual Soul. Subsequently, Archetypally the message of the 2 symbols is that balance (ox-goad) is needed for the Spiritual Soul (ox) of an individual to progress. So using Deductive Reasoning we can decipher the Spiritual meaning behind the saying of, “Spare the rod and spoil the child.” A rod is a measurement or limit, and the Spiritual lesson is that children need limits or boundaries in order to overcome the ego and achieve balance. Apart from Absolute Honesty, we said that a child also needed Consistency. This means standing your ground as a parent. Remember the angel or Spirit represents restraint, self-discipline, and responsibility; the devil or ego represents, self-indulgence, gratification, and impulsiveness. There is a constant struggle for control going on within a child, which is why the child needs Consistency from the adults in his or her life. If you do not follow through with consequences for bad behavior, such as grounding or suspension of privileges, then the child’s ego goes to work on their consciousness creating doubt about your word. A young child does not need a friend as a parent. He or she needs you to create the boundaries and limits that they are incapable of creating. After 7 the child is looking for a role model and that role will be minutely scrutinized by the ego for any cracks. So it is absolutely imperative to maintain your “rod” or limit. Your child’s Spirit is depending on it. Furthermore, because of the scrutinizing of the Inductive Reasoning it is not enough to just tell a child how to behave; you will need to show them by your example. From a very young age, the ego of the child is learning to undermine a parent’s influence and that influence is crucial as it can help a child become their true self. If you doubt a normal childhood can affect an individual that much, try the exercise below. In the exercise we want you to experience how much your childhood influenced the way you now think as an adult. Think of your first memory of your introduction to the Divine. It was most probably the first year you were aware of celebrating a religious holiday. If you were raised in a particularly religious household then you may have associated the holiday with ritual, but if your family wasn’t particularly religious then your first memory might be of celebration and fun. Below are a series of representations of one of the religious holidays of 5 major religions. To ascertain what your first impression was of your religion’s holiday, find below the row that your holiday is in and see which graphic representation of the holiday first jumps out at you. This will be the strongest and deepest impression. We deliberately chose to use clip art, as we are interested in showing you how the earliest experience of Symbols and Archetypes such as Santa Clause can affect your beliefs and opinions. With that digression, let us return to the consciousness development of children. Between the ages of 14 and 21 the scrutinizing becomes even more pronounced, because it has begun to extend beyond the home and school into the world outside. Spiritually speaking, during this period the constant struggle between the false self and the Spirit intensifies. This is because of raging hormones, which cause an almost perpetual desire for gratification. Young men and women during this stage may become so disoriented and confused that they rebel against everything. As the individual nears maturity, the Spirit within the soul is desperately trying to awaken the young person with deep questions of, “Who am I?” and “Why am I here?” Unfortunately as they often fail to find the answer; this can lead to despair and in some extreme cases suicide. During this very difficult time the young person is literally at the mercy of the forces within. Ancient Wisdom always maintained that the age of spiritual decision was 21, normally when puberty is over and the hormones begin to stabilize. There is also another aspect of the ego that a young person deals with during the time between age 14 and 21. Eckhart Tolle refers to this aspect as the “pain body” and this is far more destructive to the Spiritual development of a young person than the ego. The “pain body” is not about physical pain but emotional, which in many cases is far worse than actual physical pain. Moreover, the “pain body” operates within the subconscious and has only one aim; to feed. It feeds on the painful emotions an individual experiences. However, it isn’t content to wait for life to naturally create emotional events; it works with the ego to provoke the situations. Young people between the ages of 14 and 21 are the most vulnerable to their “pain bodies” because of all the other factors involved; such as hormones. We constantly hear adults bemoaning the youth of today as being incorrigible. On the face of it they would appear to have a case, but from a Spiritual perspective young people of today have far more to deal with than earlier generations. Think back to when you were a child, did you ever hear of Global Warming and such dire predictions of the future, or were you absorbed in just having fun? Because of the media and internet young people are constantly bombarded with negative news. Unable to do anything about it they become angry and act out, which of course feeds the “pain body”. The consequence of their acting out again creates even more circumstances for the “pain body” to feed on, becoming a self perpetuating loop. If you have or know of a young person that is exhibiting anger, confusion, and or despair and want to help them, you may want to try remembering how you felt at that age and then multiply it a thousand fold. Most teenagers go through a phase of feeling unheard by adults, which makes them angry and rebellious. These emotions are often accompanied with a feeling of not belonging. Adults can be of immense help by just listening and reassuring them that they experienced similar overwhelming emotions when they were teenagers and that these feelings will eventually subside. From a Spiritual or consciousness perspective, adolescents and teenager’s egos and “pain bodies” will attempt to direct them into acting out the anger. This will not necessarily be achieved physically, but possibly through indulging in seemingly harmless escapism; such as violent video games. In many ways, this is Spiritually more harmful because it involves the senses of sight and sound. These 2 senses as will be discussed later are how a human being creates. So indulging in violent video games actually “creates” the environment to perpetuate the situation. Before we leave this age group, there is one other thing we wish to address. We said earlier that Ancient Wisdom maintained that the age of Spiritual Decision wasn’t reached until 21. We find it interesting that young people under the age of 21 are not able to drink alcohol, yet are permitted to purchase a gun and fight in the armed forces. Moreover, when a young person commits a crime society often punishes them as an adult, locking them up with adults. Ancient Wisdom held that anyone under 21 was not held fully responsible for their actions and or decisions. That did not mean that bad behavior was excused; just not judged the same way as adult behavior. So by the age of 21 all aspects of the human consciousness have developed and the individual is considered an adult. Until now in the Fullness of Time, between the age of 21 and 38 everyone was left to make the most of life for good or bad. Individuals spent this period of time learning by experience what works and what doesn’t. During these 17 years, beliefs and opinions of life are questioned and changed or reinforced. An individual also sharpens his or her intellect developing the will or self-consciousness. This in turn develops the ego since it is an integral part of the self consciousness. Unfortunately this is also the time the “pain body” becomes the strongest, because it has the benefit of actual memories of experiences, which it can slant or skew to elicit the strongest emotional reaction. The above was the state of affairs until the Fullness of Time, which began December 21st 2004. Now although natural development is still taking place, anyone over the age of Spiritual Decision or 21, is capable of changing the way they think. This is because what was only available to individuals after the age of 38 is now available to anyone over 21. To explain: there are 3 major astrological alignments that happen at special times in an individual’s life. The first is the Saturn return, which occurs when Saturn returns to the position it was in when you were born. This happens when a person reaches the age of 29. The second is the Uranus opposition that is: Uranus is in the exact opposite position to where it was when you were born. This event happens between the ages of 38 and 44. The final one occurs around the age of 50, when the planetoid Chiron returns to the position it was in at your birth. The Saturn Return traditionally meant a sometimes drastic change in your life, but it is what happens at the Uranus Opposition that is most relevant now. Barbara Hand Clow states in her book Chiron: Transforming Bridge between the Inner and Outer Planets that until a person reaches this point (the Uranus opposition) he or she has ‘no comprehension’ of their life’s purpose. Because this is the Fullness of Time however, Spiritually guided individuals do not have to wait until they are 38 to access the information as to their purpose for incarnating. What with the ego and the “pain body” it would seem that the deck is stacked against the individual Spirit. However, the "ace up the sleeve" is found in the statement, “The Kingdom of God is Within You”, which is the fundamental Truth to Spiritual Evolution. The 2 videos Pneuma-Yod and Pneuma-Yod Gongs of Change, with the song Because of the Fear is a visual depiction of what the individual has within them. Still, the title of the song Because of the Fear relates how the Human Race is handicapped with the paralyzing emotion of fear. This has prevented our acceptance that we have the ability to end suffering. If you have watched the videos you may have wondered why we produced 2 videos to the same song. The answer reveals another way to employ Deductive Reasoning. Because this is so central to the Initiative, we will take the time to explain the videos from a consciousness perspective in the next part of Section 2. You may like to view the videos again, only instead of just watching the pictures also concentrate on seeing the patterns of conscious energy. In the last posting we asked you to look at images to see whether you are indoctrinated or not. Now we would like to go a step further, by asking you to write down what your religion’s Symbol means to you without thinking about it. If you find yourself sounding like your parents, then there is a good chance that you were indoctrinated as a child. Now stop and consider as to whether or not fear is attached to those feelings. Do you remember being warned about reading controversial material? Is there a small part of you that feels anxious about asking questions about your religion? If the answer is yes then your indoctrination goes deep. Nonetheless, through the use of Deductive Reasoning, any and all indoctrination can be overcome. One of the most effective ways to overcoming someone else’s influence is to activate your own mind, and the best way is through sight. The song Because of the Fear along with the two videos Pneuma-Yod and Pneuma-Yod Gongs of Change (herein after referred to as just Gongs of Change) were produced to awaken your latent Spiritual understanding and promote your ability to begin to question without fear. Hopefully you have a had chance to review the two videos and compare them. The differences between the 2 will be found through the use of Inductive and Deductive Reasoning. Before we get to an examination of the 2 Videos, first let us relate what was said on the Ancient Wisdom For Now, web page. You don’t believe it because of your fear. The signs are visually depicted in both videos with scenes of ancient buildings. These amazing structures can be viewed as proof of the Human Race’s ancestors ingenuity. These vestiges of ancient civilizations are the signs in the song, which were left to help us remember that we are spiritual beings having a human experience. This is further emphasized with the next 3 lines. The seekers are again epitomized the same way in both videos with the Acropolis of Athens representing the Greek Philosophers, and Machu Picchu in Peru representing the Mayans. Throughout the world, ancient artifacts and writings have been discovered that show how intellectually and technically developed our ancestors were. The lyrics repeat over and over that the signs the seekers left are ignored, but why would fear cause the Human Race to ignore these signs? The answer is found in the words, “reality has been changing slowly, to the seekers it seems rather clear.” Generally we are most comfortable with the familiar understanding that civilization has been slowly progressing to our present modern society, and that ancient civilizations were not as advanced or “civilized” as we are today. Nonetheless, as society progresses scientifically, human beings discover more and more about ancient civilizations that raise questions about that assumption. With discoveries of ancient artifacts that cannot be reproduced today, comes the realization that these people must have been very advanced; maybe even more advanced than we are. But if that is true, how could they have simply disappeared? If a person uses Deductive Reasoning, they will go within and Reason that there is a lot about the Human Race that we do not understand. However, because of fear of the unknown, many individuals simply deny any evidence that puts into doubt their accepted view of reality. In other words, fear can cause even the most rational individual to deny actual tangible evidence. Nonetheless, the chorus relates how we overcome fear to find our true selves. Although the first chorus in both videos is accompanied with scenes of outer space that move progressively nearer to Earth, it is the series of pictures below that are featured in the Gongs of Change, which depict the real location of “home” in the song. All of my children, I’ll be waiting inside for you. Can you find your way home, all my sons and daughters? I’ll be waiting inside with you. The 7 Symbols are the traditional Symbols for the chakras. However, you may have noticed that instead of being placed in an ascending order from Base to Crown, the order of the chakras follows the spiral, reproduced below. Consequently instead of the 7th chakra corresponding to the crown chakra, the 7th chakra in the spiral diagram is now the heart chakra. The second verse is where the 2 videos really diverge. In Pneuma-Yod, the pictures depict the result on the physical plane of fear. It shows the baser actions of depravity, such as slavery, and the treatment of the Native Americans. You don’t believe it because of the fear. The words above relate that the situation the world finds itself caught in, was not intended. Fear cause individuals to react often violently. They are not bad people, just caught in the overwhelming emotion of fear. Gongs of Change shows the overwhelming emotion from, as we said an energy perspective, depicted as fire and volcanic eruptions below. In later stages of the Initiative we will be discussing how normally rational people can be caught up in an overwhelming avalanche of fear. Eastern philosophy understood that fear is a mental construct that is an illusion. To understand how fear is overcome necessitates an understanding of human consciousness. However, on the physical plane there are opportunities for Humanity to rise above fear and self-preservation and see the connection between all life. Such a time was heralded with the appearance of 3 men. As shown above, in Gongs of Change this is depicted with videos of volcanoes and lava erupting ever more violently. The blur of images in Pneuma-Yod end with the detonation of the atom bomb over Hiroshima and Nagasaki. After the detonation of the bomb in Pneuma-Yod, the song stops and all we hear is the sound of the harp and images of the angelic realm. This is immediately followed in Gongs of Change with the second chorus showing various versions of the greeting of Peace in several religions. 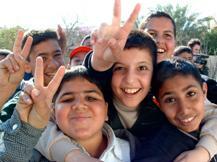 This is epitomized by a group of smiling Iraqi boys giving the peace symbol. The second chorus in Pneuma-Yod brings in the Earth Angels and Peace Makers. It portrays the many Peace Makers; such as those featured below who work tirelessly to resolve conflict in the world. Although Gongs of Change also feature Peace Makers and Earth Angels at this stage, the Earth Angels incorporate a great deal more celebrities and their organizations. In the third verse the 2 videos diverge again. The main difference is on the focus of religion. Pneuma-Yod focuses on the various institutions of religion, whereas Gongs of Change focuses on the different Scriptures or Spirit of the religions. Please don’t miss it because of the fear. Please don’t miss it because of your fear. The third chorus sums up the message of both videos by reiterating that we all have the same destination. However, Gongs of Change has a special message, which is relayed throughout the video. This is so vital to changing the way you think that we will reproduce them below. Take a moment to let the above sink in; there are 10 versions of the Golden Rule throughout the world. If you ever thought that the world’s religions are so different and could never find common ground, the above 10 quotes show that is not correct. Throughout the 3 choruses of the song, both videos portray transformation in the archetypal image of the butterfly, which is depicted in the actions of people helping one another in the video excerpt, Doctors without Borders. In Pneuma-Yod the transformation is depicted as coming about through good deeds. Although Gongs of Change also depict humanitarian acts, it offers an additional solution, through the use of sound; the Gongs in the title Gongs of Change. We will be covering How Sound Can Change the World in a later stage, but you may like to check out the document on Ancient Wisdom For Now, web page. Nonetheless, both videos depict children as the ultimate force for change. Between the different children is the Earth Flag to signify it will be the children that unite the world. We related this in the statement that the Dali Lama’s recent visit to the States was to focus on the children that would change the world. At first, this would appear to contradict the earlier information about the age of Spiritual Decision. But if we remember that this is the Fullness of Time, we may be able to see that like Jesus said, “Suffer the little children to come unto me.” After watching a strange reality show called “Kid Nation” we can see why the Dali Lama would focus on children. Watching these young people figure out how to resolve disputes and work together is an example the world leaders could do well to learn from. Finally both videos end with the quote “And ye shall know the Truth and the Truth shall make you Free.” That Truth is related in the final statement, The Kingdom of God is Within You. This is depicted by the last image featured above that has appeared throughout the video. This is the scientific depiction of the statement The Kingdom of God is Within You. We will be covering this symbol in our next posting, but before then you may like to view the video Fractals: The Colors of Infinity from Ancient Wisdom For Now web page. As you watch the video, try seeing the journey as into your own heart. Earlier we said that the “ace up the sleeve” to overcoming the ego and “pain body” is the statement: The Kingdom of God is Within You; but what does that mean? A valuable clue is remembering that Yod HeH Vav HeH, apart from representing the Creator also reminds us of the 2 forms of Reason, Inductive and Deductive. So which form of Reason helps us to understand that the “ace up the sleeve” is The Kingdom of God is Within You? To answer that, first ask yourself “How did you feel while watching the documentary Fractals: The Colors of Infinity ?” Did you feel moved as if you were having a Spiritual experience? You should have, as the destination of the kaleidoscopic journey is heaven, which is within You. Remember how we said to think of the journey as into your own heart, well the Colors and patterns in the documentary are like a dream-world matrix of consciousness. Two very good analogies for this are found in the inspired films What Dreams May Come (Robin Williams) and The Matrix (Keanu Reeves). But first let us review what Craig wrote concerning The Kingdom of God is Within You on the Ancient Wisdom For Now web page. His comments on opinions he had formed about the subject are indicative of how to employ Deductive Reasoning. So using Deductive Reasoning, let’s take a new look at Jesus’ injunction that the Kingdom of God is within from a scientific perspective. Don’t worry if some of the technical terms seem a little daunting, we will explain the technical applications of Fractal Geometry and Tortion Fields in later stages, but for now just allow your inner reasoning (Deductive) to chew over the information. You may be surprised at how much more you can understand. The Mandelbrot Set is best explained in the Arthur C Clarke’s documentary Fractals: The Colors of Infinity. The documentary actually shows the infinite that is within. In other words, it visually demonstrates how God or Spirit is within ALL Matter. We suggest you visit the site and take the time to look around a little. The video is also available for purchase. The image below shows how the equation Z z2 + C produces a set of numbers or the Mandelbrot Set and is graphically depicted as subset (points) of a complex plane represented as a piece of paper (screen). For each C or point (pixel), one observes its behavior in the sequence obtained by iteration ( ) returning the output of the equation back as its input) starting at the point on the paper (screen) identified as Z=0 and providing the first value C, which either escapes to infinity (white area below) or stays within a disk (black area below) of the finite radius. The Mandelbrot Set is all points C that the above sequence does not move off the paper (screen) to infinity. 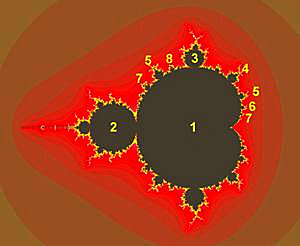 From Wikipedia, the free encyclopedia: Mathematically, the Mandelbrot set is just a set of complex numbers. A given complex number C either belongs to M or it does not. A picture of the Mandelbrot set can be made by colouring all the points C which belong to M black, and all other points white. The more colourful pictures usually seen are generated by colouring points not in the set according to how quickly or slowly the sequence…diverges to infinity. A mathematician's depiction of the Mandelbrot set M, a point c is coloured black if it belongs to the set, and white if not. The red colored set of numbers below (meaning shades or red-colored areas not yellow numbers) depicts in shades of red, “points not in the set according to how quickly or slowly the sequence …diverges to infinity”. “So now finally I know the infinite and the finite and the video made that possible by providing the infinite through continual magnification of the computer graphic plotting of numbers that fall outside of the Mandelbrot Set. One might ask how the numbers that fall outside help to prove that infinity is inside. The numbers that fall inside the set are “prisoners trapped and doomed to ultimate extinction”, and numbers that fall outside “have the freedom of infinity”, as described by the video narrator Mr. Clarke. What the equation is doing is distinguishing which numbers or points are which. The numbers that fall outside form complex patterns (fractal geometry) that can only be viewed or appreciated by magnifying or zooming in on this pattern. Magnification or zooming in on the pattern never finds a point that chaos prevents the pattern from emerging and so the infinite is found by traveling in and not out. Depicted by the words, ‘the Kingdom of God is within you’. “And so such discoveries seem to point metaphorically and literally to the direction that we must all get out of our supposed reality or Set and travel into the infinity of free will that seems to only exist in our consciousness. Our bodies and our memories seem to be trapped as it were in the Set so to speak, and only if we stand on that as a sort of relative point and gaze in or allow our conscious selves to move to infinity, will we ever be free to really know the possibilities. “The FEAR must be removed or broken to see the new horizons that await our pursuance on this guided journey of spiritual awakening. The iterations of generations seem to continually place us in that set of numbers that move to zero and are trapped and doomed to extinction. Only through our conscious choice and adherence can we change what number we represent on our next iteration or input into the equation. This can only be done in spiritual awareness and continuous conscious effort…we are each that individual number that can change its value through conscious choice and it does not take physical death to do that. In fact physical death won’t change us as a number, just start the sequence all over again. In a dynamic existence everything is changing and we all must pay attention to the changes to have any hope of knowing where we are going. “I understand fear, I almost drowned once and in my panic the only one I thought about was me. Being so focused on the fear of dying (drowning), I got blinded to the facts I was a good swimmer and that was all I needed to do then. My brother was close enough in the water for me to grab around the head and so I did that and we both went under. My dad had to save us; it was a shameful experience in that I didn’t pay close enough attention to understand that all I had to do was swim. We must all pay attention and know that our understanding is relative and needs to adjust to our dynamic surroundings. “Even our understanding of atomic structure can no longer accurately be described by a solid particle theory, but rather from an energy grouping perspective as is covered in the appendix Craig’s Energetic Perspective on Evolution. For so many years most of us believed that concept and would have rejected any notion suggesting the particles were really not solid and just energy groupings with possible intelligence. As I said our understanding is relative and possibly not understanding at all just speculation defended by an ego that may not really be our friend. How do we know? We don’t really know and so that should encourage us to consider other possibilities. I know it’s a gamble and not comfortable in most group discussions until it becomes widely accepted. For me there seems to be way too much science and mathematics that continues to tie back to ancient teachings not so long ago dismissed as legend or superstition and uncomfortable to defend in group discussions. The scientists that developed Fractal Geometry and Tortion Field Physics used Deductive Reasoning in developing them. The most amazing thing is that Tortion Field Physics can explain how Spiritual forces can literally be measured, and Fractal Geometry can explain Creation. 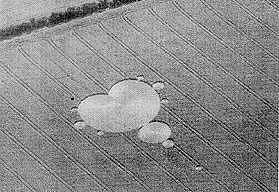 What may surprise you is that the Mandelbrot Set appeared as a Crop Circle in England near Cambridge University August 11th 1991. So much for the scientific explanation, how does the Mandelbrot Set and the statement The Kingdom of God is Within help us to overcome the ego and “pain body”? Throughout the last 2 millennia Humanity has seen “evil” as something outside of themselves; mainly because religious and political leaders have labeled everything or person that did not agree with their position as evil. In the Middle-Ages it was considered heresy to say that the Earth went round the Sun, and yet today it is common knowledge that the Sun is at the center of the Solar System. Another reason “evil” was considered as something outside was because of the passage in Ephesians 6:12 “We wrestle not against flesh and blood, but against principalities, against powers, against the rulers of the darkness of this world, against spiritual wickedness in high places.” Saint Paul wrote this letter to warn his followers that there were conscious forces that were working to undermine his mission; and there were. However, the scripture can also be applied to the non-physical consciousness within an individual. As we have shown, there are 2 aspects of the human consciousness within a person that are most definitely not beneficial to Spiritual Evolution. The key word here is “within”; the ego and “pain body” are “within” a human being until they are transformed, which is the purpose of the Initiative. Nonetheless, the “Good News” is that a human being also has an “ace up the sleeve” namely, The Kingdom of God within them. The “ace” is that at any time a person can “choose” to seek their Spirit within. As the Spirit is a Spark of God, it directly connects the individual to God. Seeking instigates the access and communication and that is why we were told to “ask”, “seek”, and “knock.” We were promised that if we asked, it would be “given”, if we sought, then we would “find”, and if we knocked it would be “opened” to us. In other words, an individual has to initiate the connection. Think of the Mandelbrot Set the same way as the signs given to us by the ancients. In the documentary, Arthur C. Clarke pointed out how Fractal Geometry patterns have appeared in various forms throughout history, but that it wasn’t until the invention of the computer that Fractal Geometry could be demonstrated. In What Dreams May Come the main character played by Robin Williams first loses both his children in a car accident, which throws his wife into an inconsolable depression. She is just beginning to come out of it, when Williams as the husband is also killed in a car accident. The plot then shifts to “heaven” where Williams (the husband) wakes up in a place where he literally creates his own environment. Later exploring “heaven” he runs into his children in the form of a grown man and woman. Interestingly, despite Williams being Caucasian, his son appears as an African American. Meanwhile on earth, his wife unable to bear the grief of loss commits suicide. The rest of the film is spent with Williams (the husband) and his children desperately trying to “save” his wife from oblivion. The other film, The Matrix is a sci-fi adventure set in a future where the Human Race has been enslaved by a technologically advanced race, which has hooked everybody to a vast machine. However, the majority of people are totally unaware of their predicament as they are all dreaming they are living a normal life. The plot centers on a small select group of people who have somehow awakened to their true situation and have learned how to interact with the dream world through a kind of lucid dreaming. Every situation in the dream world is created by the “masters” who manipulate people to do whatever they want. This is demonstrated in the plot when one of the “awakened” ones decides that he doesn’t want to live in reality and wants to join the rest of Humanity in the dream-world. Negotiating with his “masters” he lays out a list of demands as to how his dream-world will function. Naturally he wants to be successful, rich, and healthy. It is generally believed that the ancient civilizations thought of heaven as a kind of paradisiacal garden. A perfect example was the Greek Elysian Fields, which people who had lived a good life went to after death. Over the centuries, through the influence of the Church, the concept of heaven changed to a kind of celestial cloud-like unearthly realm, where wispy figures in white floated around in a sort of perpetual bliss. Yet the “Lords Prayer”, says, “Thy Kingdom come, thy will be done on Earth as it is in Heaven…”; indicating that we are praying for Heaven to come to Earth, not for us to go to a celestial realm. In later stages we will discuss the underlying reason for the change in the concept of Heaven, but for now we will return to the 2 films mentioned above as analogies of how the Mandelbrot Set shows that The Kingdom of God Within You is dynamic. One of the most striking scenes in What Dreams May Come is when Robin Williams as the main character first wakes up in “heaven” and begins to create his environment. As he “walks” through a field of flowers the Colors appear to change and melt into one another. As he becomes more acquainted with his surroundings, the Colors become more stable and fixed. This epitomizes the dynamic nature of consciousness depicted in the Mandelbrot Set. The reason that both films are needed for the analogy is because in What Dreams May Come the wife of the character played by Williams is not with him. The Matrix solves the dilemma by demonstrating that any environment or situation can be created in the dream-world. Although in The Matrix this is applied to an individual’s financial circumstances, as “Heaven” is dynamic consciousness it can be applied to constructing a scenario where your loved ones are always with you. As you will discover, there is no limit to the Creative Imagination’s ability to create its environment. Consequently, in “heaven” any loved ones whether alive or dead would be with you. This is an extremely complex issue and so we will discuss it in depth later. Returning to the Mandelbrot Set and the statement The Kingdom of God is Within You as a means to overcoming the ego and “pain body”, the message is the power is in your hands, or rather heart. Yes there are the 2 aspects of the false self within a human being, but because the vast dynamic consciousness of the Kingdom of God is within your heart, you have an unlimited source of Spirituality to access. As you will discover, there are multiple levels within you; starting with your Spark of God or Spirit, Holy Spirit, Christ-Consciousness, 3 levels of the Higher Self and the Divine Will. Each level needs to be accessed as you learn to know yourself, and becomes easier as you progress. But first you need to begin to change the way you think, and there is very Good News. Because this is the Fullness of Time, the Divine forces are helping us through inspiration. These forces have operated on multiple levels and are there to help. This help mainly manifests in subtle direction to help you discover the Truth for yourself. For instance, we were first introduced to the Mandelbrot Set during a class with a psychic medium. Inner Space as Atriel’s home was confirmed just 2 days later, when we watched Fractals Colors of Infinity, which we had been inspired to order several weeks earlier, and had just arrived. Watching the documentary, we were deeply moved not only at the beautiful symmetry of it, but also the message behind it; namely that there is a wondrous world within, which contains sentient Spiritual beings. This is what is meant by The Kingdom of God is Within. That Kingdom is available to everyone and does not require any special training or qualifications. It is in the Kingdom that we can all find God. This is because every human being contains a spark of God as his or her Spirit, allowing for direct communication. This statement isn’t surprising, because many individuals believe they can talk to God. The real breakthrough Spiritually is that it can be a two-way conversation. …There have been people who have carried out the most dreadful crimes in the name of religion. In claiming to be speaking to God and acting on his instructions, they have murdered or committed suicide in God’s name. If people thought about it rationally, they would soon realize God would never tell someone to take a life. …Remember, the gentle voice is a gift given to you, not something forced upon you. Opening yourself up to God’s Will and believing in the power of the Spirit, is what it takes to even hope for involvement in the process. …It is active belief and faith in that belief that allows the channels of communication to remain open. The moment one quits believing, is the moment the reception ceases. One does not have to fight to remove the gentle voice, but on the contrary, will have to fight to keep it. The consideration of a two-way communication with God is a clear break from the way most people think. If you haven’t experienced it up till now, we ask you to consider that it is possible. This will create new pathways in your brain and begin to change the way you think. You don’t need to attempt to if you don’t want to, just remain open to the possibility. The Know Thyself Initiative although being interactive is essentially a self-monitoring program. In other words, you will be the determining factor as to your progress. However, to assist you from time to time we will break to review your progress. This review will be in the form of questions about the previous sections. Our goal is to help you access the Spiritual intelligence within through Deductive Reasoning, and reviewing how much information you have retained is a great way to understand the process. However, as this is the first review in addition to questions about the topics we have covered so far, we will start by encapsulating the main points of the first two sections in bullets. This is a less accurate way to determine how much information you have obtained because it doesn’t ask specific questions, but it can be a good start. There are 2 levels of Reason, Inductive and Deductive. Inductive Reason is taking in information from the outside through the senses. Deductive reason is taking new information and dissecting it within for a deeper understanding. The 2 levels of Reason are portrayed in the Tetragrammaton (The Creator or Yahweh). The name Yahweh (Jehovah in English) is a simplified version of YOD HEH VAV HEH. The Hebrew letter HEH represents Reason and the 2 HEHs are relating the 2 levels of Reason. The Mysteries incorporate the Mystical Arts of Numerology, Archetypal Images of the Tarot, Astrology, and Color. Ancient Wisdom and the Kabbalists saw numbers as reflecting the more subtle energies and vibrations of the world around them. Your name can hide your Spiritual destiny, which can be revealed in the Hidden Codes of Life. Perfect examples of Archetypes are the images in the 22 Major Arcana trumps or cards of the Tarot. An Archetype is something that represents a model or universal concept. There are 31 components in the Hidden Codes of Life, which can reveal the strongest influences on an individual. Astrology affects a new-born by exposing the brain to the energies of the planets, which imprints the inner consciousness by the positions of the planets in respect to each other. Astrologers divide a natal chart into 12 segments, which they refer to as houses. To each of these houses is assigned a sun-sign or zodiacal sign. The position of the Sun determines what sun sign the baby is born under. Each of the12 houses rules or influences various elements of your life, such as finances and health. There are 7 Double Hebrew Letters that represent the Seven Sacred Planets: Mercury, Moon, Venus, Jupiter, Mars, Sun, and Saturn. The Seven Sacred planets are associated with the 7 main chakras. The Mystical Art of Color reveals that the Philosophers’ Stone of Alchemy wasn’t about turning lead into gold, but transforming the body (lead) into Spirit (gold). Ancient Wisdom saw Color as representing different energies. Colored images in the Major Arcana carried information about Archetypes and consciousness. The Colors Red and Turquoise mean if you use Reason correctly you transform Reason into its higher level; Intuition. This brings illumination to how you can change the physical world. From birth to age 5 some children use both Inductive and Deductive Reasoning, because they remember their past lives. By the age of 7, unless the memories have been fostered by an adult, most children will have no concept of any pre-existence. After 7 a child normally switches to using Inductive Reasoning by taking in information through the five senses. Age 7 is when the ego begins to exert control over the mind of the child. An adult’s influence can determine whether the true or false self of the child emerges victorious. The Ancient sages often hid secret wisdom in seemingly regular everyday sayings. Children need Honesty and Consistency from their parents to curb the influence of the ego. Your first impression of a religious holiday will be the deepest. Between 14 and 21 scrutinizing extends beyond the home and school into the world outside. Between 14 and 21 the constant struggle between the false self and the spirit intensifies because of hormones. Between 14 and 21 the young person is at the mercy of the forces within. Ancient Wisdom always maintained the age of spiritual decision was 21. Between 14 and 21 the “pain body” fully develops, which is more destructive than the ego. The “pain body” operates within the subconscious and feeds on the painful emotions. Young people between 14 and 21 are most vulnerable to their “pain bodies” due to hormones. By the age of 21 all aspects of the human consciousness have developed. Between 21 and 38 beliefs and opinions of life are questioned, changed, or reinforced. The Fullness of Time began December 21st 2004. Until a person reaches the Uranus opposition he or she has ‘no comprehension’ of their life’s purpose. Today Spiritually guided individuals over 21 can access information as to their purpose for incarnating. Because of the Fear lyrics, relates the Human Race is handicapped with the paralyzing emotion of fear. Fear has prevented our acceptance that we have the ability to end suffering. Ancient structures can be seen as signs of proof of the Human Race’s ancestor’s ingenuity. Examples of the “seekers” are the Greek Philosophers’ and the Mayans. The Human Race ignored the signs, because we are most comfortable with the familiar. As society progresses scientifically, human beings discover more about ancient civilizations. Discoveries of ancient artifacts that cannot be reproduced today indicate ancient civilizations may have been even more advanced than we are. Fear can cause even the most rational individual to deny actual tangible evidence. The Gongs of Change Video depicts the real location of “home” in the song Because of the Fear. Fear can often cause individuals to react violently. Eastern philosophy understood that fear is a mental construct that is an illusion. The use of atomic weapons rocked the Spiritual planes. We all have the same destination. There are 10 versions of the Golden Rule throughout the world. Transformation can come about through good deeds. Another means for transformation can be through the use of sound. Children are the ultimate force for change. The Dali Lama’s recent visit was to focus on the children that would change the world. A reality show called “Kid Nation” shows why the Dali Lama would focus on children. There are multiple levels within you; starting with your Spark of God or Spirit, Holy Spirit, Christ-Consciousness, 3 levels of the Higher Self, and the Divine Will. Each level within you needs to be accessed as you learn to know yourself, and becomes easier as you progress. Because this is the Fullness of Time, the Divine forces are helping us through inspiration. Divine forces help is mainly manifesting in subtle direction to help you discover the Truth for yourself. To benefit the most from this bullet method used to determine how much you have retained, read each one to see if it sounds familiar and brings to mind additional information. If nothing comes to mind at first, don’t give up, but continue to read the bullet a few more times. If after several attempts nothing happens, go back and locate the bullet information then re-read the section. In developing your Deductive Reasoning you will find that the information will surface quickly in your mind, but again this is early days so give yourself a break and use the adage; if at first you don’t succeed, try, try, try again. After reviewing the bullets you may want to try answering the questions below. Brain scientists tell us that any material we read (Inductive Reasoning) gets recorded in the brain. The trick is to learn how to access what you have recorded through Deductive Reasoning. Like the other method above this is achieved by reading a question and allowing the answer to resurface. This is not simply remembering, but accessing the deeper levels of the mind. Again, don’t worry if at first the answers elude you; just write down what comes to mind. Then go back to the text and find the answer. At this early stage you are learning to think in a different way so don’t be surprised if you don’t remember the answer and yet are able to recall many other details concerning the subject matter. What is important is to examine your recall process to see how your mind works. Initially Deductive Reasoning recalls information in large packets of data. As you become more familiar with the process, you will find that you retain information in a kind-of short-hand manner. This is how the review can assist you in uncovering the deeper levels of how you remember. For instance; if you find that your answer was wrong and yet you went right to the area of writing in which the correct answer was found; there was probably something about the information surrounding the answer section which impacted you more than the answer itself. Once you learn to refine your Deductive Reasoning you will be able to pin point what your mind keyed in on, which seared the information on to your brain more intensely than the rest of the text. Inductive Reasoning uses only Intellect and Memory, but Deductive Reasoning incorporates Imagination, which with Reason connects all 4 components of the thinking process. Moreover, Inductive Reasoning is linear, meaning that as each piece of information is received it is brought to the front of the line, so to speak. On the other hand Deductive Reasoning is not bound by any limits and spreads all information it receives out. To understand this, think of Inductive Reasoning as storing the information sequentially (serial) in a filing cabinet, and Deductive Reasoning spreading (parallel) everything out on the floor for you to see. You may be thinking that this is all very well and good, but how do I apply it in everyday life? To understand and apply the difference between Deductive and Inductive Reasoning in practical terms, think of a woman needing new clothes for her job. She is on a tight budget and can only afford 2 skirts or pants, 2 tops or sweaters, 2 jackets, and 2 pairs of shoes. If she uses Inductive Reasoning she will go to the store and buy 2 complete outfits. However, if she uses Deductive Reasoning she would be able to recall and imagine what clothes she already has and instead of buying two separate outfits, would purchase 8 individual items that will match up with clothes she already owns. Consequently instead of just acquiring 2 separate new outfits she will have enhanced her entire wardrobe. The way a person learns and retains new information is much the same; in a nutshell Deductive Reasoning facilitates enhancing existing knowledge, and Inductive Reasoning replaces old knowledge with the new. With the refinement of your Deductive Reasoning, your Intellect, Memory, Imagination, and Reason evolve into Intuition. The Initiative is designed to help you in this thought processes in order for you to retain and recall more information. Which has a stronger Electromagnetic field, the brain or the heart? Name the institute that discovered the answer. How many houses in a Natal chart? Who was known as the Father of Sacred Geometry? Which planet according to the Kabbalists represents the number 5? How many Tarot trumps/cards make up the Major Arcana? Which Tarot Card Archetypally represents Mother Nature? What did the Alchemists want to turn lead into? Archetypally, which consciousness is represented by The High Priestess? What archetypally does an old man with a scythe represent? Which color represents the Moon? Which Tarot trump/card represents the 2nd Level of the Higher Self? What are the Seven Sacred Planets? What are the higher octaves of Mercury, Venus, and Mars? In the Spiral diagram, which chakra is the 7th? How many letters in the Hebrew Alphabet are designated Mother letters? How many times does the color Red appear on its own in the Major Arcana? At what age does a child usually forget its past life? What is the age of Spiritual Decision? At which University in England did Benoit Mandelbrot teach? After considering your consciousness make up and the possibility of having two-way communication with God, it is time to apply Deductive Reasoning to constructed beliefs to see if they are built on sand or solid rock. Consequently in Section 3 we will be applying Deductive Reasoning to a re-examination of the greatest story ever told. If you haven’t already downloaded or purchased a copy of The Good News An Alternate Theory, you will need to do so before the next posting. Also we suggest that you read it through at least once, because it will help you as we will be examining the text paragraph by paragraph.